There are many perks to freelancing, but taxes are not one of them. You have no one automatically holding back part of your paycheck, and you get slapped with a self employment tax on top of that. In order to avoid a serious April 15th panic, you have to be the one set aside part of your paycheck. For me, this magic number has been 10%. Every single paycheck, 10% gets put into savings. At minimum. Since I’ve implemented this, making my estimated quarterly tax payments has been a breeze. If you have some sort of debt (student loans, car loan, credit cards, whatever) or are saving up for a big purchase, you can (should) do another 10% to that as well. That’s only 20% of your total paycheck, but it makes a difference. Believe me when I say that having the financial side of your business in order will make the creative side easier, as you won’t have to stress over it. On hours you’re available to clients, on number of revisions included in the project fee, on cut-off dates for taking on work before a vacation. Do not try to be all things to all people at all hours. That way lies burnout and stress and just general misery. If you answer an email at 11pm, that client is going to always expect you to be available at 11pm. If you don’t specify number of revisions, you may find yourself at revision #13 when you only charged for three. And no one wants to spend the last day before vacation rushing to get client work done (that time is reserved for rushing to get packed, amiright?). Set limits from the get go, and train your clients to respect your time. You’ll breathe easier, get to have a life outside of work, and as a result your work itself will benefit. Win win. Even with the most easy-going, reasonable client, there will likely come a point where they ask for something that would be a disaster if you executed it exactly as they’re requesting. Or they suddenly remember something that needs to be included that wasn’t discussed in the scope and you have to start back at square one after 10 hours of work. Or they completely ignored the detailed instructions you wrote out on how to update their website and it’s now broken and you have to drop everything and fix it. In other words, something frustrating or angry-making. The shoot-from-the-hip nature of email can make it tempting to hit reply right then. But don’t do it. Even if you’re making an effort to be restrained and polite, your annoyance will probably seep through. If possible, wait 10 minutes, or an hour, or until the next day. Then calmly address the issue, including any options going forward, changes in your project fee, or reasoning as to why it might be better to go a different direction. It’ll be better for everyone in the long run. I’m not talking about the here’s-my-pitch-here’s-my-card kind of meeting people. Or at least, not just that kind of networking. Those can be a nightmare, particularly if you’re an introvert like me. But this day and age has plenty of other options for finding likeminded people. Get on Twitter and follow/interact with people in your area that are also freelancing, or do the kind of work you want to do. Join smaller meet-up groups of fellow freelancers, or fellow designers, or whatever niche you’re in. Find a group of people who understand what you do because they do it, too, and hang out with them. Whether it’s casual coffee or a more structured panel with a topic. This is great not just for gig-seeking or possible partnerships, but also venting about problems, bouncing ideas around, and just having someone who gets it. Because, let’s be honest, your mom will probably never understand why you freelance when you could have a steady paycheck. So you’ve gotten your freelance business off the ground and have some regular clients and things are going well. Yay for you! Now don’t get too comfortable. The times are always changing, and that means new developments in how people in your niche do business. Even if you don’t learn how to do every new thing yourself, you need to be aware of them and adjust your work accordingly. For example, responsive web design is now a thing, because people like things to look as pretty on their phones as on their desktops. Do I know how to code responsive websites? Not from scratch. I can, however, take a WordPress theme that is already responsive and layer my design on top – but that requires knowing that responsive design is a thing, and picking out a template accordingly. Alternately, you might have clients repeatedly coming to you for something you don’t exactly do. If it’s something you’re genuinely interested in and could teach yourself, why not do that? You’ll keep the client with you instead of having to send your business elsewhere. I personally love Skillshare for all sorts of self-paced classes. I’m taking a class on hand-lettering right now, which will be awesome for logo design. Adding to your skillset for services people have been requesting is never a bad move. So there you have it, my golden rules of freelancing. The first few were definitely learned the hard way, not gonna lie. 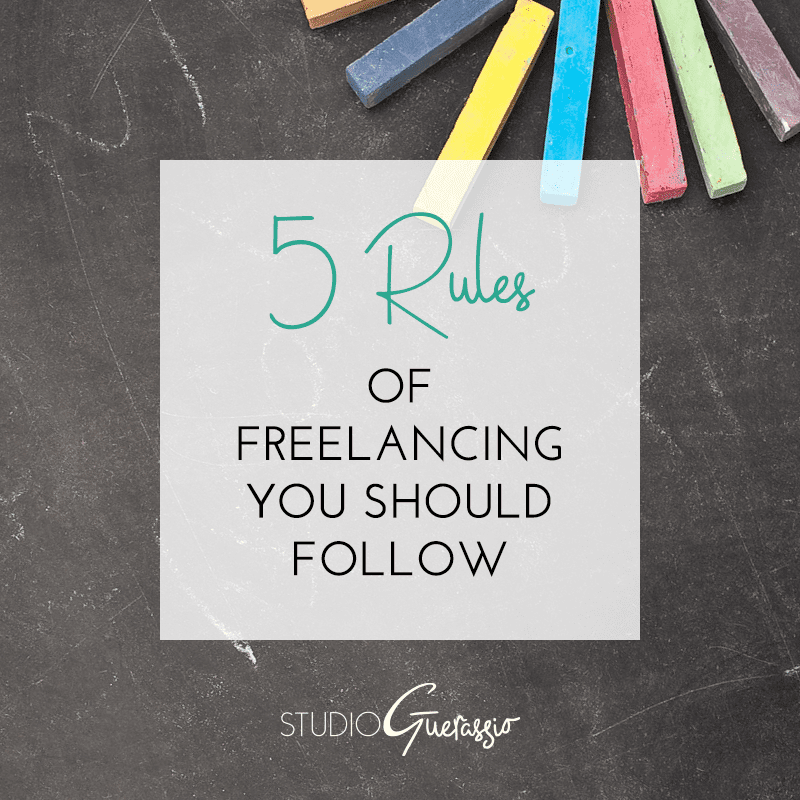 Fellow freelancers, do you have any rules you live by that you’d like to add?